Apples are the perfect fall learning theme! Learn to count and recognize numbers to 30 with this fun and colorful Apple Math Activity. It's a hands-on way to build number sense! Does your family have a favorite fall activity? We love making the drive to our local apple orchard! Out to the country we go to tromp through the rows of apple trees to pick several bags of bright red apples. Truth be told, I love going so we can buy fresh baked apple cider donuts!! Yum!! To help get you in the apple mood, I've created an Apple Math Activity to use with your preschool and/or Kindergarten kiddo. 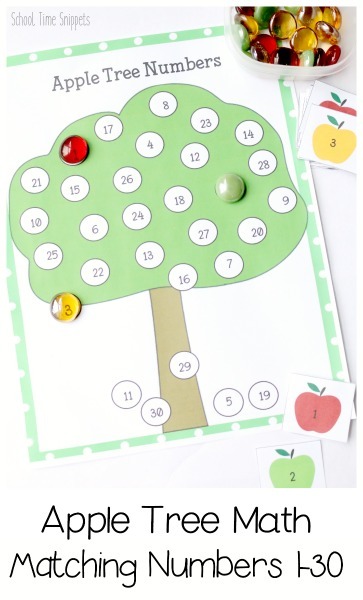 This apple tree math printable works on number recognition to 30. We've created a few other printables similar to this but with letters: see our Alphabet Tulips Match and Color Printable and our Alphabet Raindrops Matching Printable. We changed the idea of the activity up a bit to work on number recognition for numbers 1-30. Small manipulatives, like glass gems, encourage plenty of fine motor skills development within this activity. You could also use Do A Dot Markers , mini apple erasers , or dot stickers . Using such manipulatives are great ways to sneak in working on fine motor control and finger dexterity. 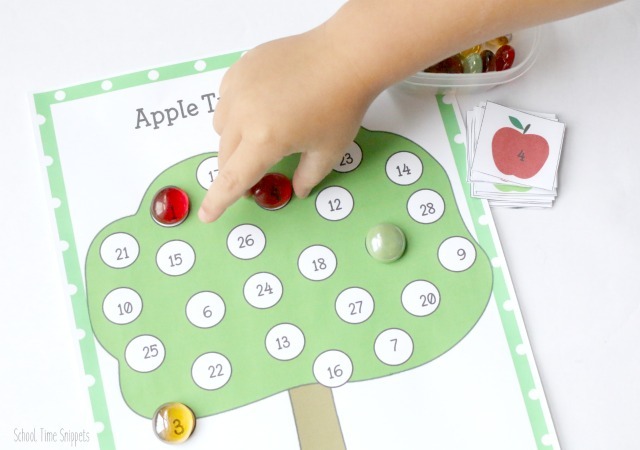 The Apple Tree Number Matching Printable consists of an Apple Tree Number board and two sheets of small apple cards with matching numbers. Most likely, it would be a good idea to at least laminate the apple cards so they do not get ripped or crumbled... and then you could do this activity again throughout the fall to continue working on math skills like number recognition. Once the cards are printed and laminated, cut each apple card out. Either leave them in numerical order, or mix them up! Have the child grab an apple card and find the number on the apple tree. The apple cards consist of red, green, and yellow apples. You could have the child place the same color glass gem on the apple tree as on the apple card. For instance, the child draws a number 4 red apple and then places a red gem on the apple tree where he/ she finds the number 4. Continue until all the numbers in the apple tree are covered. Another way to use this playful apple math printable is for calendar time the month of September! For each day, have the child find the number and use a Do A Dot to color it in and then place the apple card in a pocket chart ! Or you could use this Apple Tree Number Matching Printable as an assessment tool; a fun way to sneak in testing your kiddo to find out what numbers he/she to work on by simply calling out a number and having your child find the matching number in the tree. So many ways to use this versatile Apple Math Printable! Hope you enjoy!